Well, I have decided to up the anti! ‘Walking For Lions’ walk is only weeks away. Besides running my print raffle, I have decided to also make some donations myself. 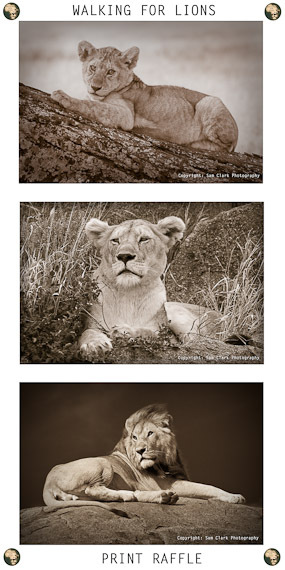 Not only will you be in the draw of winning a collection of Lion prints for your wall, but know that you are helping to save the majestic and iconic species… the Last Lions! When you donate, please make sure that you let me know via FB, so I know to enter you into the draw. Thanks so much everyone, from myself, WFL, and most of all the last Lions of Africa!